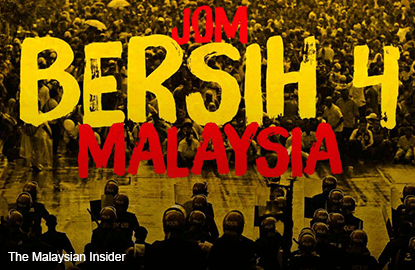 (Sept 2): Police today questioned seven organisers of the Bersih 4 rally over the two-day demonstration last weekend, asking them about planning and execution details, as well as the RM2.4 million in public donations they had received. Chairman of electoral reform group Bersih 2.0 Maria Chin Abdullah, said police had also asked them about the contents of their media statement issued on July 29, about the launch of the rally on August 14 and details of each committee member. "They asked us about the rally itself, how we managed it, how we dispersed the people at the end of the rally and how we organised our volunteers," she told reporters after meeting with the police at the Bukit Aman police headquarters today. "We, however, exercised our rights not to answer many of the questions, including about the donation. We will answer them in court if we are charged." Maria was questioned along with Bersih 2.0 secretariat member Sarajun Hoda Abdul Hassan, as well as Masjaliza Hamzah, Farhana Abdul Halim, Fadiah Nadwa Fikri and Adam Adli Abdul Halim, for two and a half hours today. They were accompanied by 10 lawyers including Datuk Ambiga Sreenevasan, Ramkarpal Singh, Eric Paulsen and Latheefa Koya. The seven were summoned today following several police reports lodged against the organisers of the 34-hour rally on August 29 to 30 in Kuala Lumpur. They are being investigated for concealing design to commit offence, attempt to commit activity detrimental to parliamentary democracy and unlawful assembly, which are charges under Sections 120, 124C and 141 of the Penal Code. Maria, who said that Bersih had so far received RM2.45 million in donations, said that an audit would be done on its accounts and they would also prepare a budget on what it was going to do with the money. "Quite a bit will go into the rally. The rest will go for the delineation cases, voter education, voter registration as run up to the 14th general election," she said. Although the rally had been peaceful and did not see any preemptive arrests before the event, Home Minister Datuk Seri Ahmad Zahid Hamidi said police could still take action against its organisers after the event under the Peaceful Assembly Act and other regulations. He said police would monitor the rally leaders as well as all speeches made during the event, which also had gatherings held simultaneously in Kota Kinabalu and Kuching. The Bersih 4 rally, organised by Bersih 2.0, demanded the resignation of Prime Minister Datuk Seri Najib Razak, the right to dissent, the strengthening of parliamentary democracy and other institutional reforms. The police were earlier lauded for exercising restraint and for not disrupting the 34-hour rally in Kuala Lumpur. A day before the rally, Putrajaya moved to ban the use of yellow with the words Bersih 4 in whatever form.